• What are companies’ legal obligations under sanctions? Mark Dunn is responsible for the development and delivery of LexisNexis Business Insight Solutions due diligence products and services. Zia specialist in International Sanctions, AML and ABC. Ranked in Legal 500 he advises on all aspects of corporate and financial crime compliance and was previously the global head of Sanctions and AML/ABC Policy at Barclays. Zia is a current FCA approved ‘Skilled Person’ for Financial Crime. Zia qualified as a lawyer in the UK in 1999 and is also qualified to practice in Ireland. This webinar introduces some important techniques for making decisions under stress, on time, without bias, and in group environments. As an introduction to the one day seminar on Improving Decision Making and Expert Judgement on 4th April 2019, you will get a flavour of the course to help you understand the breadth and depth of the subject and techniques taught. The CQRM (Certified in Quantitative Risk Management) has become the fastest-growing professional qualification in quantitative risk management and quantitative methods applicable to all industries. It is an international certification awarded by the International Institute of Professional Education and Research (IIPER). This webinar will showcase how individuals can maximize and update their skills, knowledge, and experience in quantitative methods and risk management, ensuring clear paths to success within their current roles as well as fast tracking to future careers. Prof. Dr. Mun is the IIPER-CQRM Program Director, coordinating worldwide executive programs, professional accreditations, and education standards in quantitative methods and risk management, and is also responsible for ensuring high-quality teaching and continuing education among the IIPER Certified Trainers. Supply chains are becoming ever more complex, particularly with the increase in outsourcing and the advancement of multi-tiered global supply networks. More and more organisations are now faced with direct and continuously evolving operational and legislative risks as a result of global market disruption or malpractice in their supply chains. This Supply Chain & Risk Management webinar provides participants with a glimpse of the global supply chain risk landscape. Definitions of risk management and new techniques and tactics to mitigate risk will be discussed, along with profiles of early adopters of Supply Chain Risk Management. Are you looking at implementing a new risk reporting framework or update one that you have already? In this webinar we will explore some of the options that are available. Learn how to get the most from tools such as risk registers, risk and control indicators and risk matrices. Consider the options available when designing reports and identify the limitations of common risk reporting practices. Risk reporting is an important output from the risk management process and should be a key input into both strategic and operational decision making. But if the wrong tools are used or reports are poorly designed then reporting can do more harm than good. Are your reporting arrangements adding value to management decision making and promoting intelligent conversations about risk tasking and control or are they little more than a procedural exercise? People are the single most important asset in any organisation, yet they can often be the most vulnerable. The opportunities and threats people present to the operations and strategic objectives of their organisations constitute “people risk” – an area of risk often ignored because of the perceived complexities involved in managing it effectively. This webinar will focus on “risk intelligence”, which refers to the way in which an individual’s values, risk competences and behaviours come together to drive their perception of risk, approach to risk-based thinking and decision-making. Th webinar will introduce the diagnostic tools that can be used by organisations to evaluate the “risk intelligence” of staff, whether in the operational 1st Line, the 2nd line’s risk and compliance functions or senior management. environment that underlines the need for digital upskilling. 11a.m Why get qualified and why choose IRM? This webinar focuses on informing professionals working in infrastructure/logistics on the benefits of getting qualified with the IRM. Topics include: IRM background, qualifications overview IRM qualifications, distance learning, blended learning and benefits of studying "The student experience and what I’ve gained"
Join us on this webinar to listen to Graham Nicol present on why an effective and dynamic risk management framework is vital for the successful delivery of large projects, programmes or portfolios within an Infrastructure capital asset delivery environment. This webinar covers how to communicate the need and associated benefits of risk management to employees, delivery partners and stakeholders, how best to identify and assess risk (qualitatively and quantitatively), when to apply appropriate quantitative techniques, whilst challenging schedule integrity standards to support a QSRA. All of which should inform proactive decision making that aligns to projects/organisations risk culture. Following significant revisions to the FRC’s UK Corporate Governance Code in 2018, Risk Managers should consider how they should respond to the key features of the new Code. In parallel with assessment of the implications of the updated FRC Guidance on Board Effectiveness, this webinar will review the headline features: managing risk culture, the role of the Board in governance and risk, the importance of stakeholders in risk assessment and why Risk Managers should focus on Board effectiveness evaluations. Setting risk management in the context of more demanding governance requirements will bring greater recognition, but is also more challenging. Resilience is achieved through a combination of the organisations agility, decision making and effective management of risk, that will ultimately protect and increase value of the organisation for its stakeholders. Risks do materialise. As such, building resilience to enable organisations to become more resilient, ensuring they can recover quickly and effectively from major operational disruption and strategic crisis events is vital. This unique webinar gives you the insights to understand why taking an integrated approach to resilience management allows you to add and protect value and absorb and adapt to change. The discussion will focus on how put into action the core elements to prevent, respond to, recover and learn from disruptions in your own organisation. This webinar focuses on informing professionals working within insurance on the benefits of getting qualified with the IRM. Topics include: IRM background, qualifications overview, distance learning, blended learning and benefits of studying including insights from our students in "The student experience and what I’ve gained"
It seems clear that the basic frameworks and principles that have supported corporate risk and crisis management for the last twenty-five years are beginning to be outpaced by the scale and scope of the emergent risks that we are now facing.This webinar covers the main themes of corporate risk & crisis management and the development of organisational frameworks that can support effective risk and crisis management planning at the highest level. 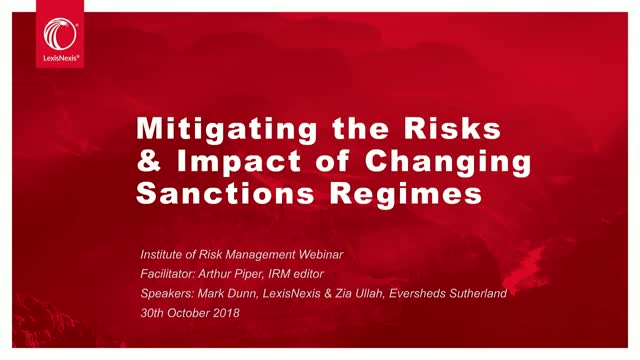 This webinar is based on the Level 5 Award in Corporate Risk and Crisis Management being hosted by the IRM from 29th-31st October. IRM qualifications will help you to build your risk management skills and knowledge. Studying with us also demonstrates your credibility with employers. This session offers benchmarking on how Risk leaders conduct business continuity processes, and balance these initiatives with risk management objectives. These insights can be used to build your BCM program if you are starting and also to review your existing program against our guidance and insights. Hot topics on risk management delivered by experienced risk practitioners who have first hand experience of implementing and enhancing risk frameworks.